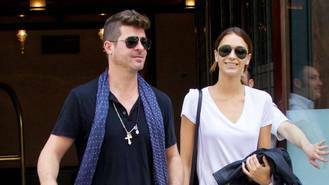 The Blurred Lines hitmaker began dating model April Love Geary in late 2014, just months after separating from his actress wife Paula Patton. Robin and April, who is 18 years his junior, have been together ever since, and now they are preparing to start a family. The 22-year-old mother-to-be shared her baby news with fans on Instagram on Thursday (17Aug17). "Robin and I are very excited to share with you all that we're having a baby!" she captioned a photo of the baby's sonogram. April went on to reveal their child is expected to share the same birthday as Robin's father, actor/singer Alan Thicke, who died in December (16), aged 69. "The due date is March 1st, Alan's birthday!" she added. Sources tell TMZ.com the unborn baby is a girl. Robin, 40, has yet to comment on the news, but the kid will be a sibling for his seven-year-old son Julian, from his marriage to Patton. The high school sweethearts wed in 2005, but according to TMZ, the former couple is still yet to finalise its divorce, after becoming engaged in a custody war over Julian at the start of 2017. The Mission: Impossible actress accused her ex of physically abusing both her and their boy, and obtained a protective order barring the singer from contacting or going anywhere near her, her mother Joyce, or Julian. In March (17), Paula and Robin were reported to be nearing a new custody agreement, although the details of the deal had not been made public.